Climatic experts are monitoring the possible emergence of an El Nino event in Latin America. Northeast Brazil has experienced extremely dry weather compared to higher rainfall in Argentina consistent with an emerging El Nino pattern. Accordingly projections for the Brazilian soybean harvest are lower with the USDA estimate for the 2018/2019 crop of 122 million metric tons based on December data. Precipitation anomalies have persisted through January 2019 and dry weather has intensified over the Center-west of Brazil. 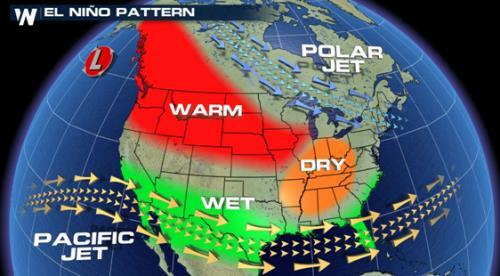 The National Weather Service Climate Prediction Center has issued a 65 percent chance of a mild El Nino developing in North America during the spring of 2019. For further information on the development of an El Nino event and its consequences to U.S. crop production enter “El Nino” in the Search block on the WELCOME page.